Rusty suspension arms, seized locknuts, bruised knuckles and calipers in a dire state of repair was the state of play and in the end I did relent and go and buy an angle grinder to sort the first part out - what a purchase! If you buy only one tool, make it an angle grinder. If anyone is a regular fan of the Simpsons, you may recall an episode where Homer gets a gun and ends up using it for everything, including opening his beer can and changing the TV channel - the grinder has a similar multi-purpose quality about it. It made light work of the the seized nut, swiftly turning it into a 12ft plume of sparks across the garage. Quick swap for the sanding disk and it made a fantastic job of removing the rust and corrosion too taking the arms back to bare, shiny metal in seconds. The final job on the suspension arms was to remove the old damper brackets. 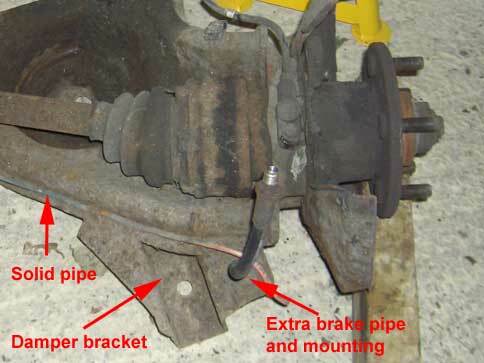 Because the Granada has disc brakes at the rear, there is an extra flexible hose that goes from the caliper to a hole at the top of the damper bracket. A solid pipe then runs along the arm where another flexible hose joins and goes to the original chassis. There seems to be two ways of dealing with this - either chop most of the bracket off, leaving a "tab" for the extra hose and replace the lines as Ford intended them to be (see pictures) or (and thanks to CRC again for this) it appears that the Pilgrim supplied hoses are a perfect length for running straight from the caliper to a bracket bolted onto the chassis. At this point I didn't have my chassis or brake hoses to hand to see for myself, so I thought I'd better leave my options open and left the "tab" in case I want/need to run the brake pipes as they were originally designed. 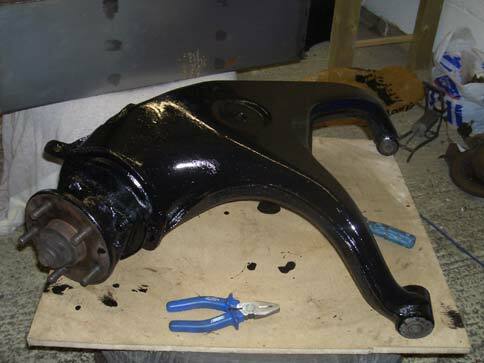 A couple of coats of Hammerite and the rear arms are ready to go. The bushes appear to be fine, so they won't need replacing. One of the wheel bearings sounds a little "dry" (if that's the right term - it's not grinding like the bearing has broken up, just sounds like it needs regreasing), but I'll have to wait before the arms are on the chassis and attached to the diff before I can apply enough torque on the hub nut to undo it. 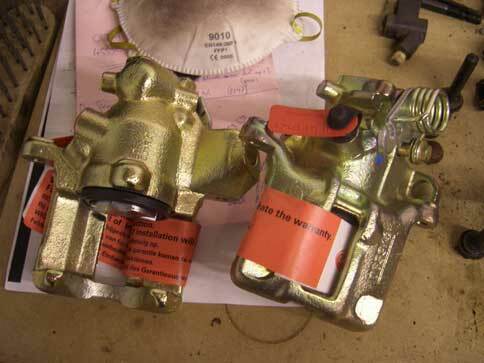 I gave up with restoring the rear calipers, the lack of suitable parts from Ford and the comparative cost of obtaining recon units meant I took two bags of corroded bits to Camberley Auto Factors and swapped them for two extremely shiny, beautifully clean units. A great decision in hindsight, the reconditioned units are as good as new. The only thing they didn't come with were the brackets and slide bolts that attach to the hub (although randomly they do come with new dust boots for them), so I will need to clean the old ones, but I don't mind because it is a trivial job compared to rebuilding the calipers. 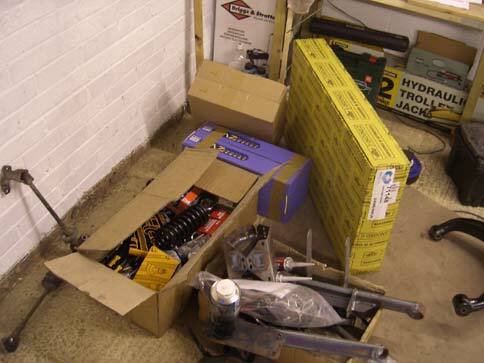 Meanwhile, amidst this near-frenzy of rusty activity, I was trying to organise the delivery of the chassis and other bits. Poor Tony had taken his lorry to Ireland for the kit show and it promptly spat it's gearbox some way outside of Dublin on the way back and he was forced to leave it there. Unable to deliver the chassis, he suggested it may be quicker for me to come and collect it instead. I phoned up a few van hire places, but finding the time to organise it and actually finding a van big enough was too much effort, especially as the cost of hire + fuel was nearly Pilgrim's delivery charge anyway. I decided to wait for the lorry to be fixed. Far sooner than I expected, Penny phoned on Monday to a) ask why I hadn't come to collect my stuff (whoops, forgot to phone them about my decision to wait - sorry guys!) and b) the lorry was now ready if I wanted to go back to Plan A. We arranged to it to be delivered last night and as promised it turned up about 6.30pm (how often do companies give you an exact delivery time, that's out of shop hours AND stick to it?!). The guy from Pilgrim and I manhandled the chassis off the back of the lorry (not an insignificant weight - I've pulled all my shoulder and back muscles!) and into the garage. After he left, I jacked it up onto axle stands (which in itself was surprisingly tricky - with the chassis on the floor there's almost nowhere to wedge the jack in to lift it!) and started rumaging through the assorted boxes. Which brings me to my current position. I've still got the driveshafts to clean, paint and regrease and the differential and steering rack to dust down and check over. The urge to start playing with the new pieces is almost too much, but I must be strong and at least finish the rear calipers before I start building! 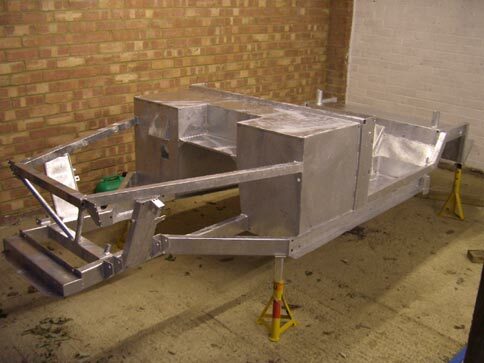 The first job will be sealing the chassis which I hope to start this weekend. Need to buy some more Hammerite to cover the wishbones and diff hanger too. Is there nothing an angle grinder can't do?